Image: Simone, a member of the girls' 2016 County Championship winning squad presenting a replica shirt to the clinicians/senior lecturers at The SSIC. 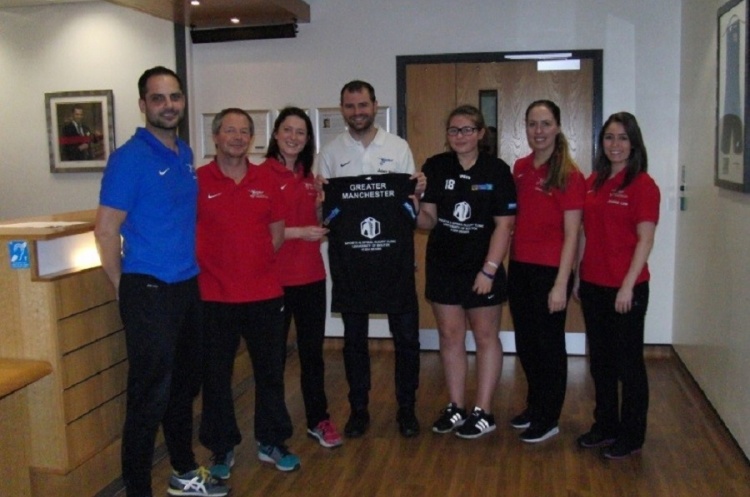 Greater Manchester under 16s County handball squads have benefitted from a new partnership with The Sports and Spinal Injury Clinic based at the University of Bolton. Under the partnership the Clinic has sponsored the boys and girls county teams’ kits, and treated players. The Clinic is linked to the University of Bolton’s Sports Rehabilitation BSc (Hons) Degree - where assessment and treatment of injuries is clinician-led with the supervised assistance of students. This gives students a broad range of theoretical and vocational skills and knowledge, equipping them for roles in sports. Both of the Greater Manchester squads qualified for last December’s National County Championships at Stoke Mandeville, England Handball’s National Training Centre. The girls’ team were crowned champions, while the boys lost just once, at the semi-final stage. The squads’ kit was supplied and printed Decathlon Bolton.